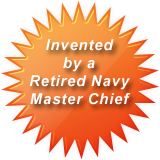 Two retired U.S. Navy Chief Petty Officers with a combined 42 years military experience noted the need for this product. We conducted over a decade of research, trial-and-error development, and eventually included focus groups, test marketing, and formal business planning. Keen Totes, Incorporated and our flagship product, the Medals & Ribbons Organizer was created. This product is all new! It meets the need of the military and first responders worldwide to efficiently and neatly secure and organize ribbons, medals, and uniform devices while traveling during numerous Permanent Change of Station transfers and temporary additional duty or business travel. The Medals & Ribbons Organizer prolongs the appearance and life of awards and can reduce wear on expensive uniform clothing. Our research indicates a product such as the Medals & Ribbons Organizer was never available in the military or civilian marketplace until now! Over ten years of commitment, conceptualization, research, and testing, has fine-tuned this product to meet the needs of the military forces. The nature of many first responders and non-uniformed services share the use of multiple awards, badges, and devices that make the Medals & Ribbons Organizer a product with both broad and lasting appeal. After conducting several focus groups to test the viability and sale ability of this product and to test consumer reaction to pricing and overall design, we found very favorable results within a very conservative audience  the men and women of the U.S. military. Eighty six percent of active duty military members surveyed said there was a need for our product! They noted they would buy our product if it was on the market and they would recommend it to coworkers. Test marketing, at selected active duty installations, over a sixteen day period, has shown a sales average of 11 Medals & Ribbons Organizers per day. All manufacturing and shipping is contracted through Mercury Luggage Seward Trunk, a Jacksonville, Florida-based company known for its quality products and customer service since 1878. Today Mercury provides high-quality, licensed products for the U.S. military, PGA, and the USGA, among others. PLEASE NOTE: Keen Totes, Inc. sells its products online at www.keentotes.com and through approved wholesalers and product distributers.